The best Christmas gifts for runners (hint hint!) We’ve compiled this guide to the best Christmas gifts for runners so you can leave it open on your computer as a handy hint to make gift buying easier! What runner doesn’t like gadgets? The ultimate has to be a GPS sports watch – fun, useful and full of functions! 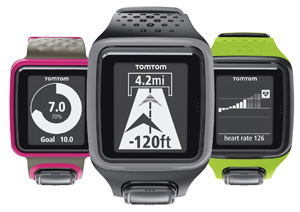 TomTom’s new Runner GPS watch is a lovely slim design, great for women runners, and it tracks everything you need including distance, time, pace and calories with an extra-large display and full-screen graphics. There’s nothing like opening a book on Christmas morning. For runners, the best book we can ask for is a real, paper running diary you can hold in your hand and flick through as 2014 progresses. Online versions certainly have their plus points, but we still like a physical running journal – great to refer back to throughout the year to chart progress. A pretty hardbacked notepad would do the job, or you might prefer a proper running training diary: we like The Runner’s Diary by Matt Fitzgerald (available on Amazon). You can never have too many base layers, and why not add the latest designs to your running wardrobe at Christmas? 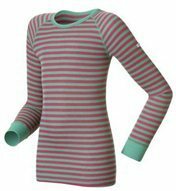 ODLO has a new long sleeved crew neck base layer in its Warm Originals range, which performs really well but looks great, too, making it ideal if you need to shed a few layers and still look smart! Its got silver ions in the material for effective odour management (so you can wear it to the cafe at the end of your long run and feel fresh!) We love the striped version. We predict that these will be a big hit in 2014: activity monitors track a range of data from your body, including daily activity output, running data and even sleep quality. They work via mobile apps and online software. Three of the best are iBitz Unity (by GeoPalz) (which tracks steps, distance, calories and weight and works with an iOS app), the Pulse (by Withings) which includes heart rate measurement and automatic run detection, tracking of steps, distance, elevation, calories and quality of sleep and the Orb (by Fitbug) which tracks sleep, steps, calories and distance covered, wirelessly communicating with the app and the user’s online account. Another item runners can never have too many of is winter running socks! 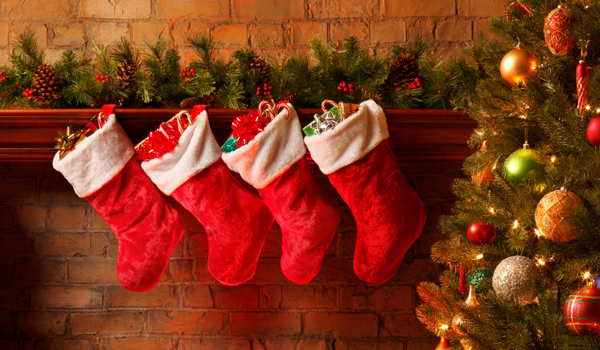 And socks are the traditional Christmas stocking-stuffer gift. Don’t settle for ordinary socks this Christmas; go for high-tech designs which benefit you and the world around you. 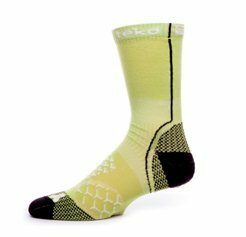 TEKO have launched these eco-friendly performance socks for runners, made of recycled and responsibly sourced materials. We like the Firefly Reflex which uses the latest high visibility reflective materials, ideal for this time of year, giving you extra visibility and safety for Winter training runs. How about a real treat for your running training? Vouchers for The Running School will help ensure 2014 is your best running year yet. With locations across London and in Kent, Bristol, Woking and Southampton, the Running School believes that running is a skill that can be developed and improved. They’ll teach you to run faster and more efficiently giving you valuable skills for the rest of your running life!